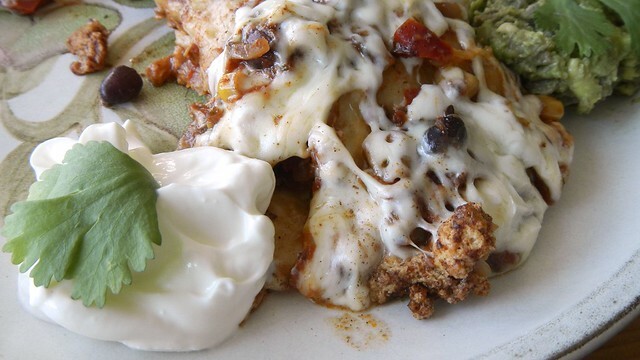 This recipe from the kitchn came with so many caveats about how these are not your ordinary baked enchiladas, and how they end up being a gooey mess but they’re still good, that it was almost worth making them just to see if they lived up to all the anti-hype. 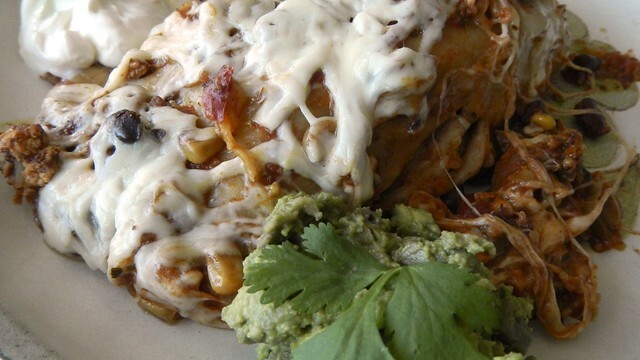 They’re easy, they’re tasty – they’re messy and not crispy at all. And still good. So give them a try. They are a great way to use up weird leftover bits of things. 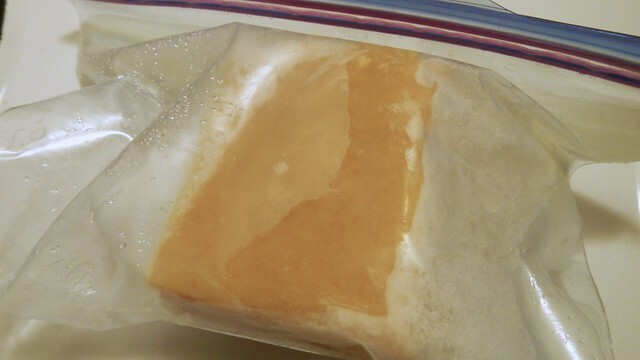 This is what tofu does when you freeze it. 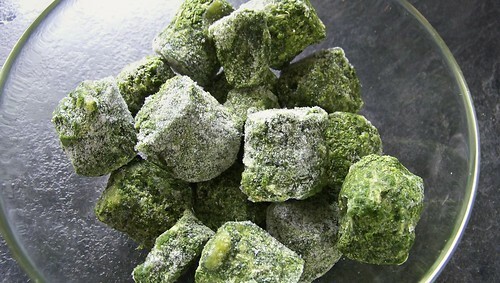 People like to freeze it because it goes crumbly, so we tried it as an experiment after making stir fry one night. 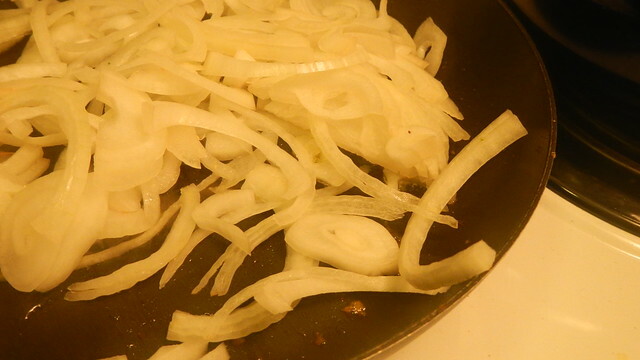 Start by chopping up 1 small onion. Dice up 1 red bell pepper. Drain and rinse 1 16oz can of black beans. Divvy out 1 cup frozen corn. Mix all those together in a bowl. Grate up 1-2 cups good melting cheese, and add in 1/2 cup of that cheese to the bowl. 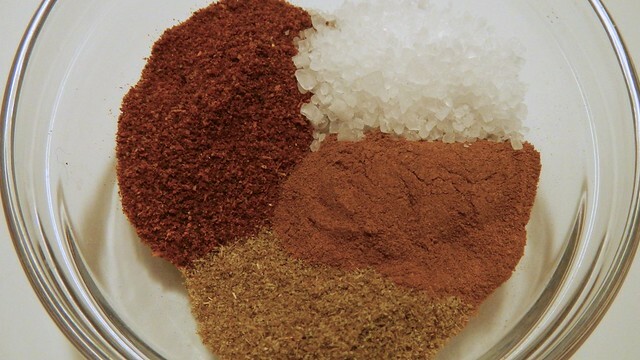 Mix together as well some spices: 2 teaspoons chili powder, 1 teaspoon cumin and 1 teaspoon kosher salt. I find often that this sort of food genre is benefitted by adding in 1 teaspoon cinnamon as well. 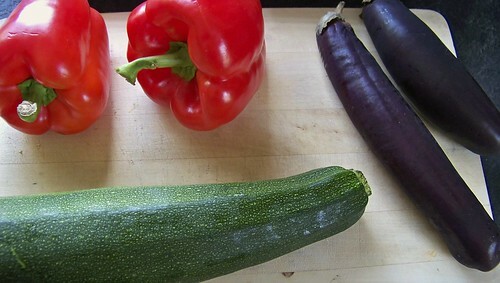 Tip that into the mixed veg. 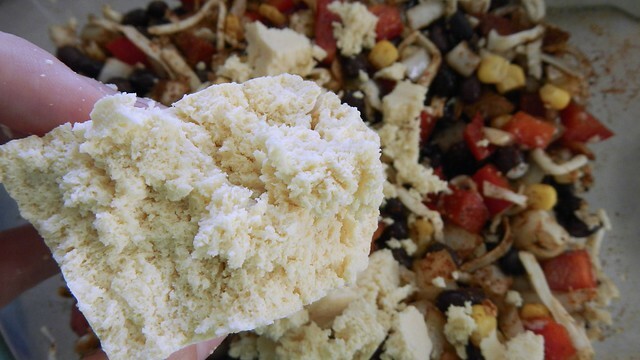 Add in any leftover ground meat or chicken you have, if you have any, or this weird crumbled spongy thawed tofu. I really felt like I was breaking up a sponge. Later, I felt like I was EATING a sponge. 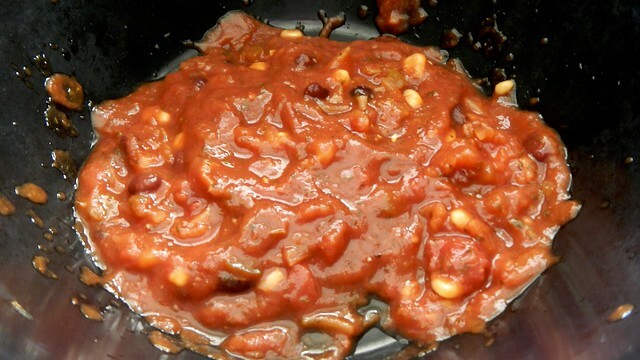 In the bottom of a 4-6 quart slow cooker, spread enough of a 30oz jar of salsa to coat the bottom. 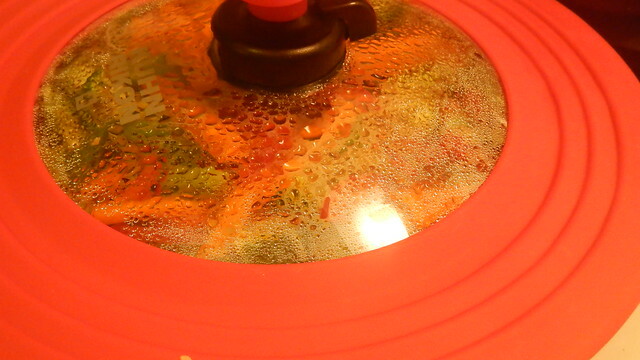 You’ll note here that we have a very bowl-shaped slow-cooker. This probably works a bit better in a more flat-bottomed version. 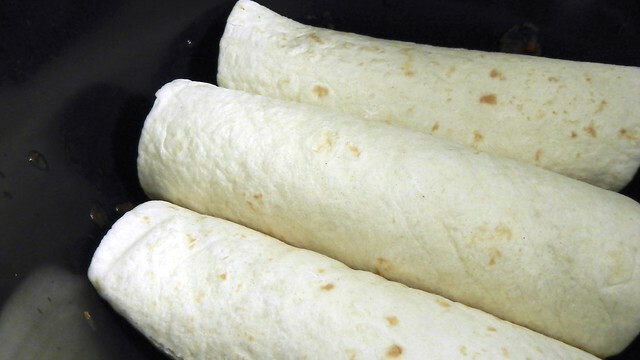 Grab a package of flour tortillas (ours were the small size, pack of 10). 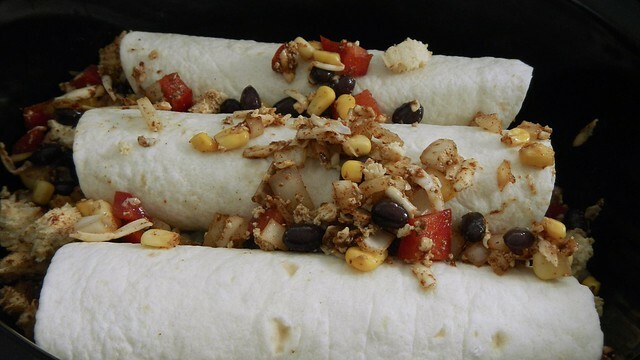 Scoop about 1/3 cup of that vegetable filling into each tortilla, roll it up, and lay it seam-side-down in the slow cooker. 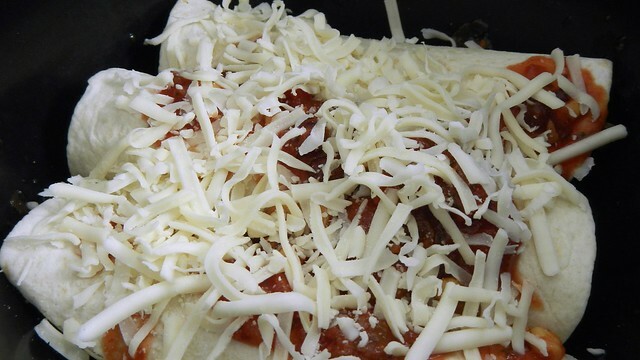 Once you’ve got a layer (with our shape of bowl, that didn’t take long), sprinkle with more salsa and some more of the cheese. 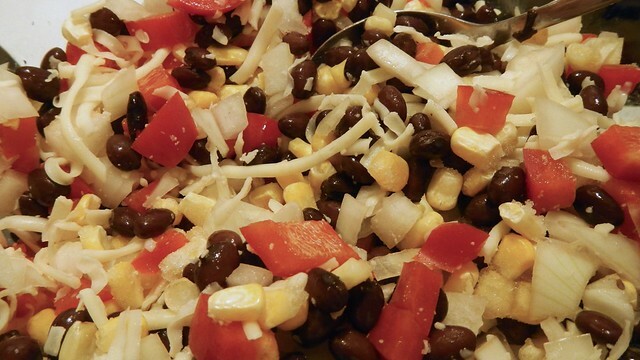 You should probably end up with only two layers but because of the shape of our bowl we had three, so it was a good thing I grated more cheese. 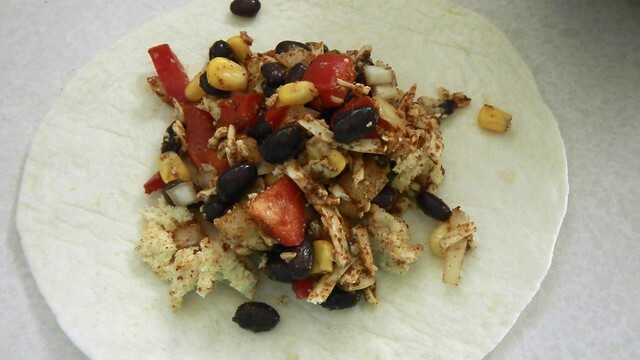 Any extra filling can be piled on top. Then add in the rest of the jar of salsa. 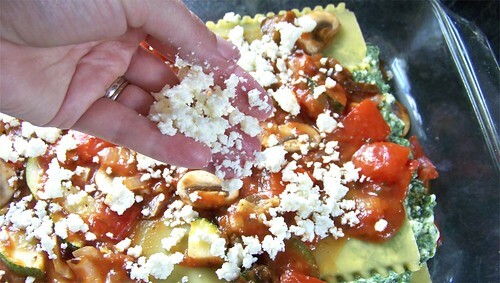 Resist adding on the rest of the cheese – keep about 1/2 cup of it back for the end bit. 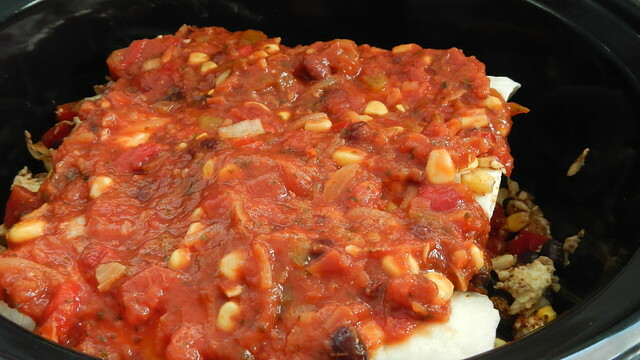 Cook on high for 2-4 hours (or on low for 8 hours if you’re prepared for extra mushy enchiladas). In the last 15 minutes of cooking, take the last 1/2 cup of cheese and sprinkle that over top, close the lid, and let it melt. 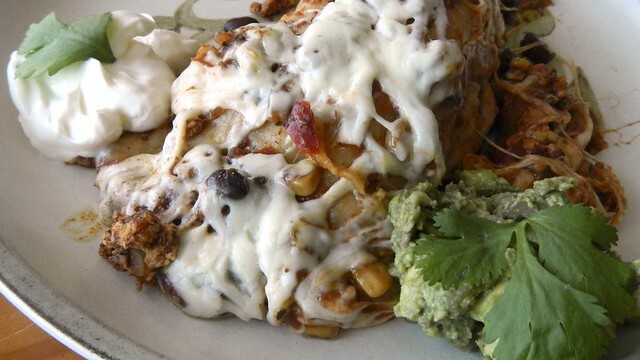 Serve with sour cream, guacamole, and cilantro, or whatever else floats your enchilada boat! Me: What do you want for dinner? Pie: I dunno. What do YOU want for dinner? Me: I dunno. 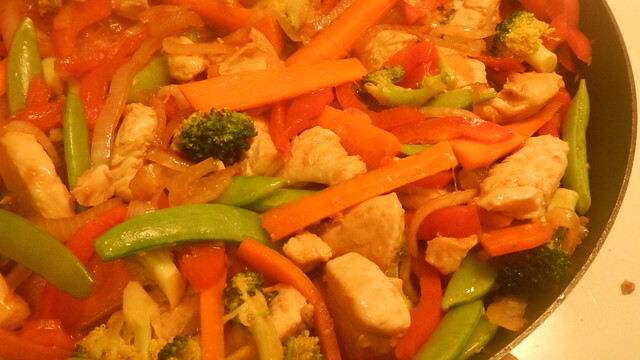 Stir fry? And that, ladies and gents, is how 85% of our weekday meal conversations go. 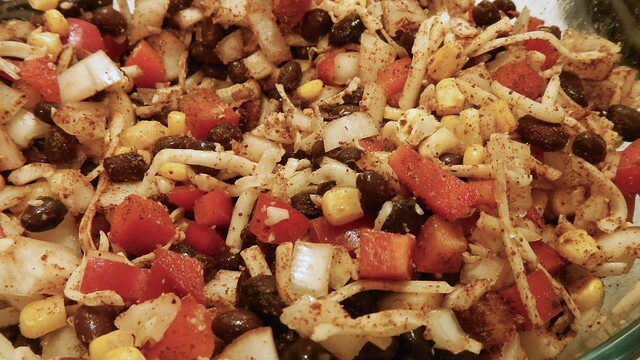 Usually we end up making a stir fry – it’s an easy, relatively easy, and healthier alternative to a whole bunch of the pre-made meals you get at the grocery store. 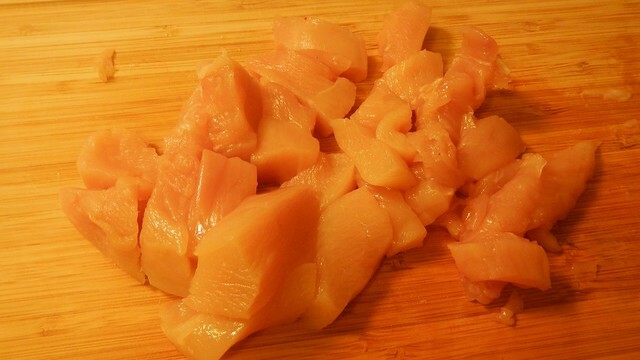 First, cube up some chicken. Or beef. Or tofu. Whatever floats your boat. 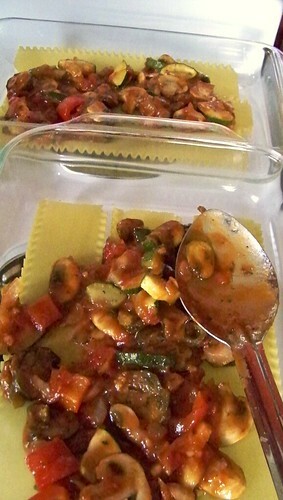 Then brown it in a pan with a dash of olive oil, some minced ginger, and minced garlic. 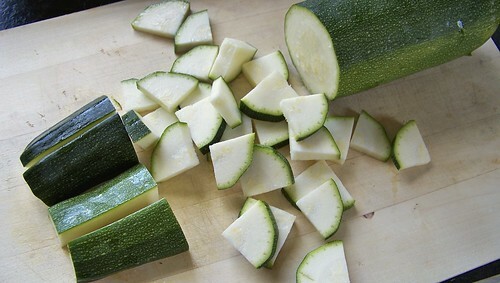 While that’s going on, chop up some vegetables – any kind you like. 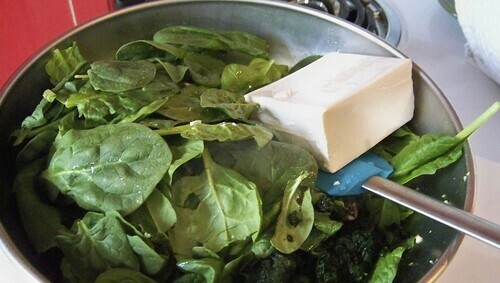 Slice them thin so they will cook quickly. 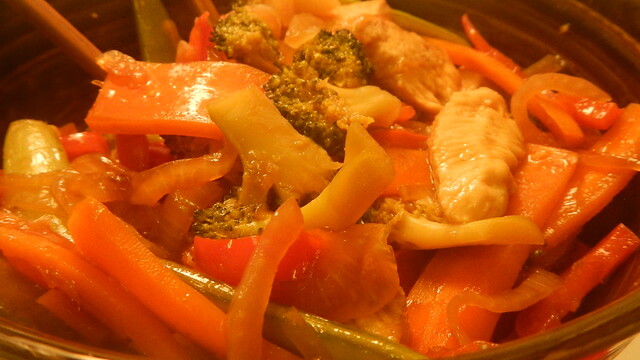 We used carrots, sugar snap peas, red peppers, onions, and broccoli here. 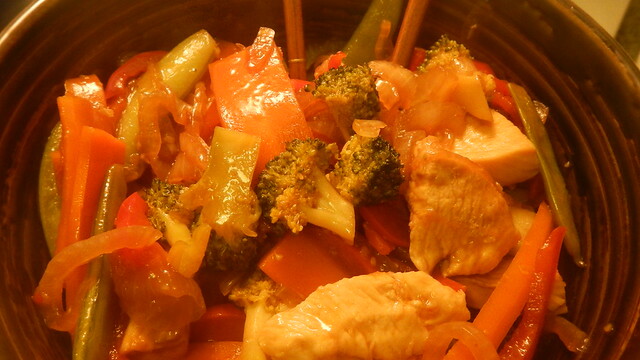 If you want, you can also cook some rice or noodles to serve as a base for the stir fry. 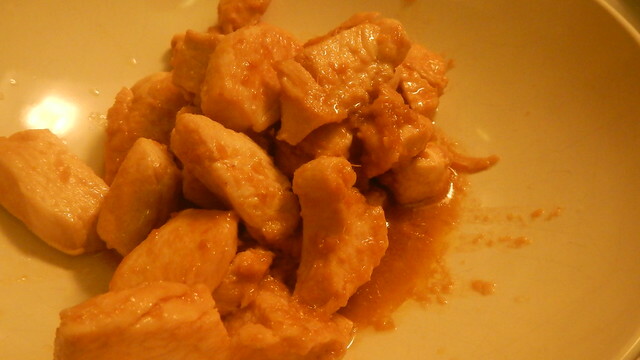 When the chicken is cooked, haul it out of the pan and put it aside in a bowl. 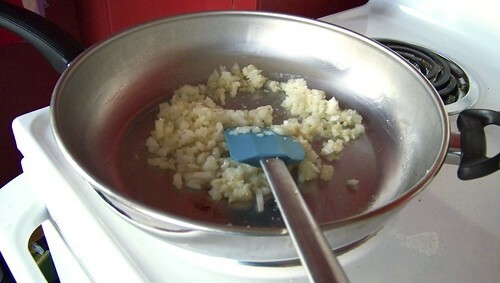 Tip your onions into the pan to soften first. 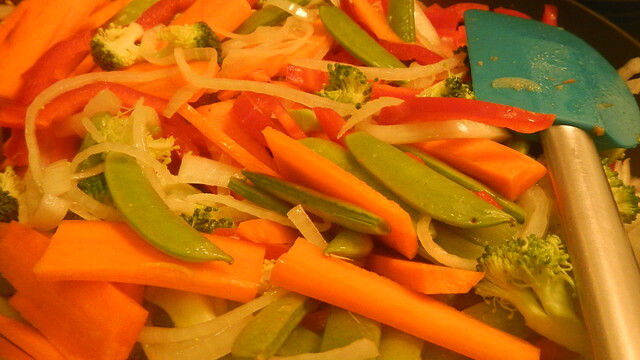 Then add in the rest of the veggies. 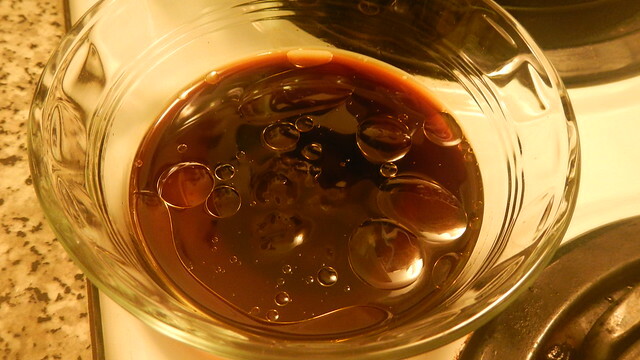 Whip up a quick sauce of about 2 tablespoons plum sauce, 1 tablespoon teriyaki sauce, 1 tablespoon hoisin sauce, and 1 teaspoon peanut oil. Feel free to experiment with proportions and different sauces – we’ve experimented for a few years and this is the combo we like the best. 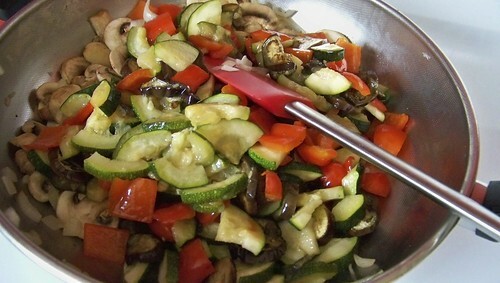 Pour the sauce over the vegetables, stir it in, and pop a lid on the pan so the vegetables have a chance to steam a bit. 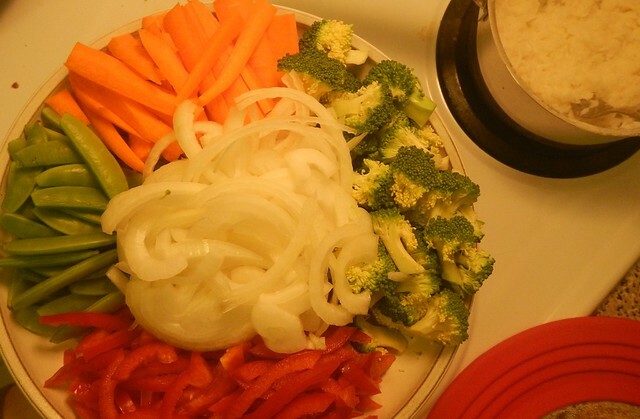 How long this takes obviously depends on the amount of vegetables you have. You want them tender but not soggy. 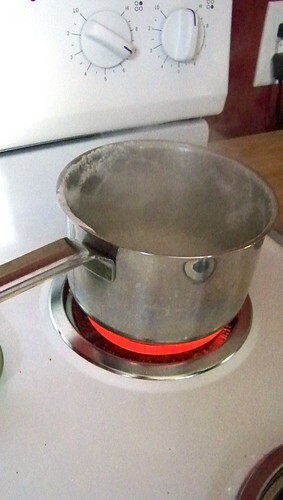 Toss your chicken back in to re-heat, then serve immediately over your rice or noodles. This will be our final tofu recipe for you folks for a while. Our digestive systems are not used to so much soy and they have unequivocally had enough. The Pie especially so. Poor man. Pity him that his wife cooks new things for him on a regular basis. Tsk. 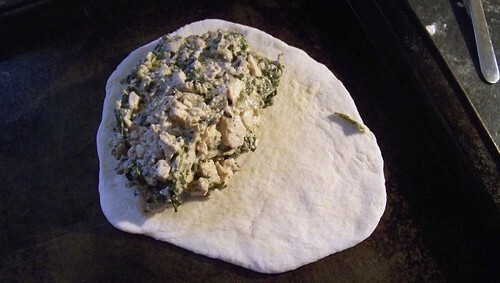 The last time the Pie and I attempted calzones, we ended up with floor pizza. I was determined to get it right this time. 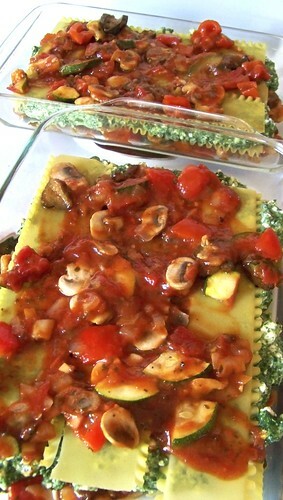 The recipe below, with some modifications, comes from the Savvy Vegetarian, and it’s pretty easy. 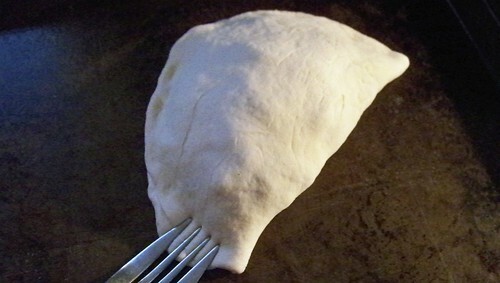 The dough is nice and stretchy, and I could definitely use it again for a calzone with a different filling, which is exciting! The yield for this is 10 hand-hold-able calzones, and I halved it (because there’s only the Pie and myself — Gren doesn’t get people food). 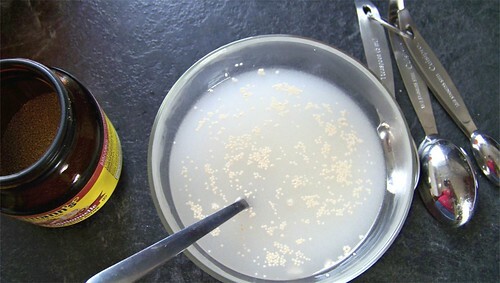 In a small bowl, dissolve 1 teaspoon granulated sugar in 1 1/4 cups warm water. 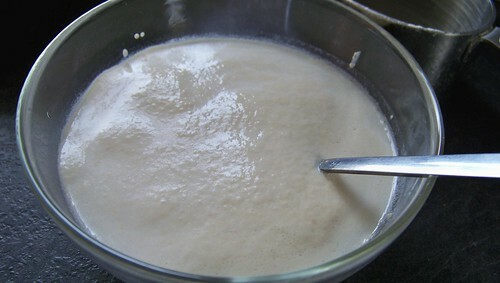 Stir in 2 teaspoons active dry yeast and allow that to sit for 10 minutes. Or until it gets all foamy. 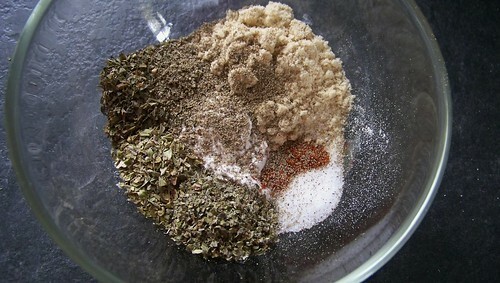 In a larger bowl, add 1/2 teaspoon salt to 3 cups flour and mix well. Rub in (exactly how it sounds) 1 tablespoon olive oil. Rub it between your fingers until there are no large clumps left. 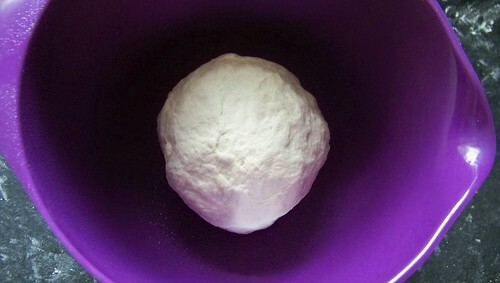 Stir the water/yeast mixture into the flour until it forms a shaggy ball. Make sure to get all the floury goodness at the bottom of the bowl. 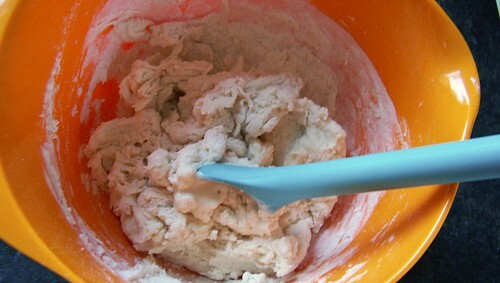 On a floured surface, knead the ball for about 10 minutes. 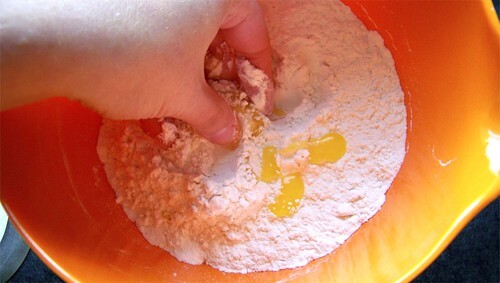 The more you knead it, the tackier it will get, so you will need to add more flour on occasion. Also, keep in mind that the more you knead it, the more elastic it will be (because you worked all the gluten together). You want your dough to be nice and stretchy. 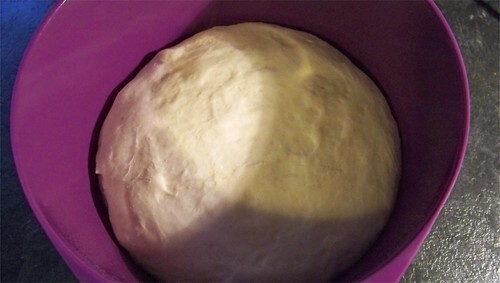 Place the dough in an oiled bowl, cover it with a clean cloth and set it in a warm place to rise for about an hour. 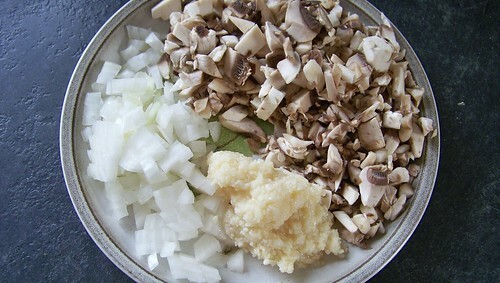 Dice up 1/4 cup onion, and about 8 mushrooms and toss them in a frying pan with 2 tablespoons olive oil and 2 tablespoons minced garlic. Sauté until soft. 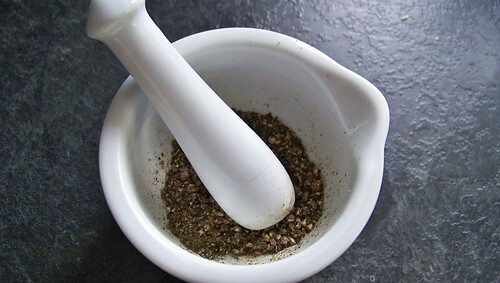 In a small bowl, mix up 1 tablespoon flour, 1 tablespoon powdered vegetable stock, 1/2 teaspoon dried marjoram, 1/2 teaspoon dried oregano, 1 teaspoon dried basil, a pinch of cayenne, 1 teaspoon salt, and 1/2 teaspoon ground black pepper. 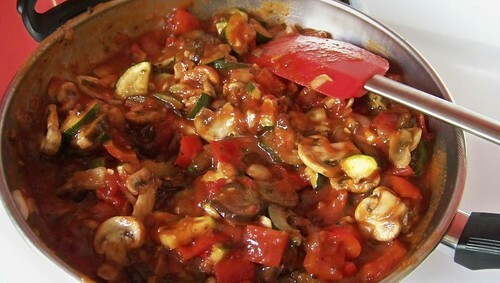 Toss that on the vegetables in the pan and stir it around. 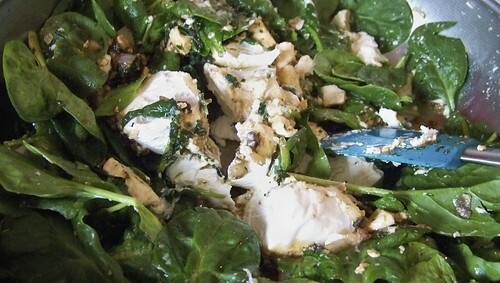 Plop in 16 ounces fresh baby spinach (you can use frozen spinach, if you thaw it and drain it first), as well as 2 12-ounce packages of firm silken tofu and a dash of soy sauce. 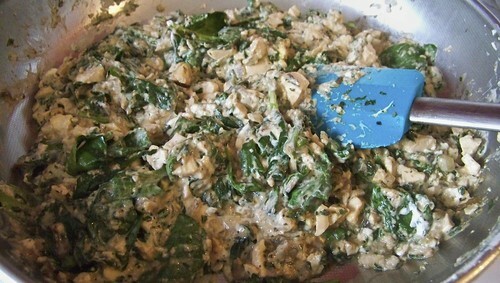 You can break up the tofu before you toss it in, but it gave me something to do while I waited for the spinach to wilt. I had some leftover chèvre, 8 ounces worth, so I tossed that in as well. 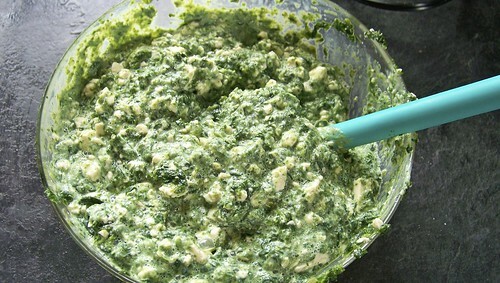 So if you’d like to add that to this recipe, chuck in 8-16 ounces goat’s cheese and stir it around until well-incorporated and completely melted. 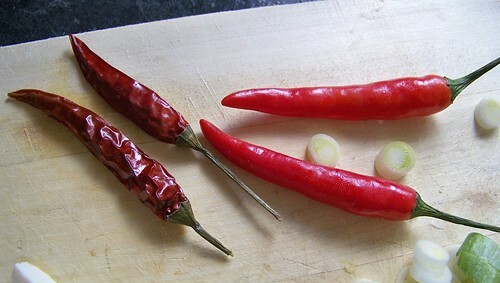 Remove the mixture from the heat. Punch down your dough. Literally. Divide it into 10 equal parts, rolled into balls (remember, my recipe is halved, that’s why you only see five). On a floured surface, roll each ball out into a 6″ round. 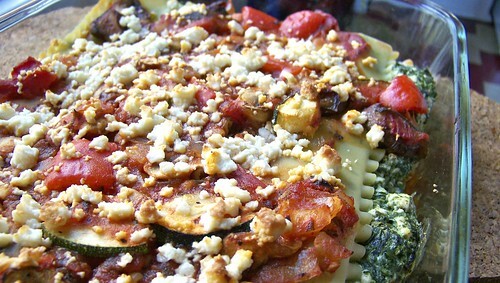 Divide the filling into 10 equal parts and place each portion on a round, slightly to one side. 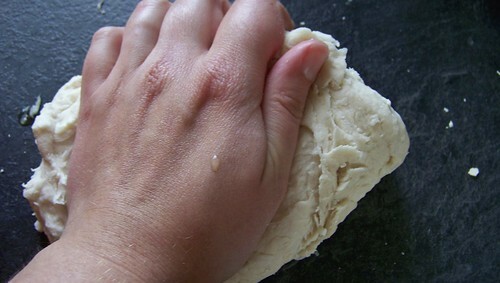 Wet the edges of the dough with your finger and fold over each round to make a half circle. 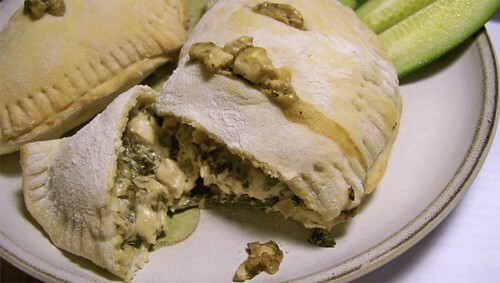 Squish down the edges with your finger and crimp with a fork to seal them. 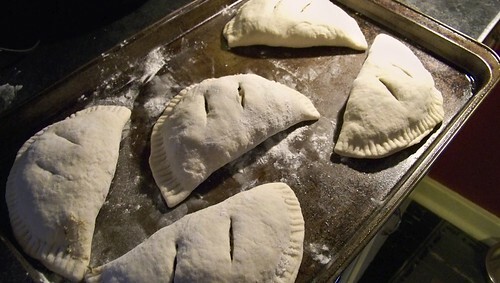 Place the calzones on a baking sheet. 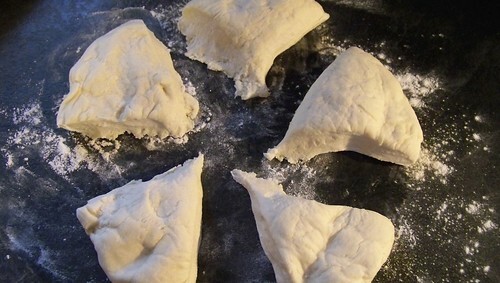 You can brush them with oil and sprinkle them with salt if you like, for a crusty, salty top. I chose to cook ours on our pizza stone, which I put in the oven when I turned it on. 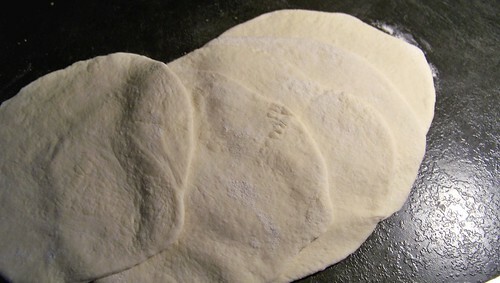 Cut two diagonal slices in the top of each calzone to let the steam escape. 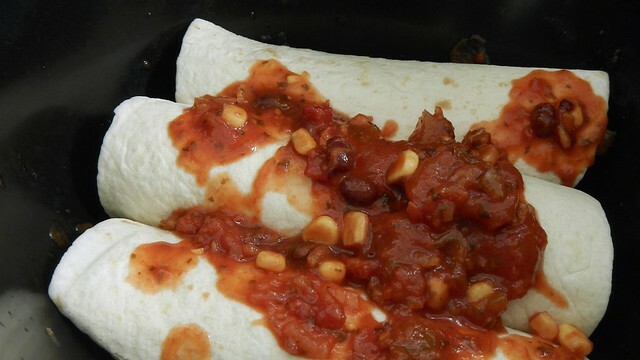 Bake for 15-25 minutes, until the dough is golden brown and the filling bubbles up through the holes. 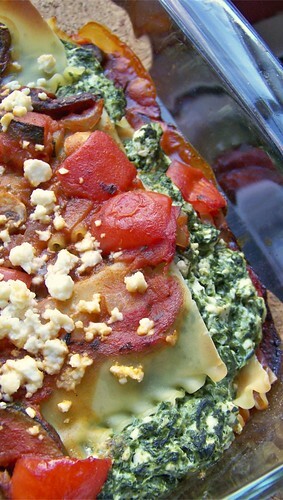 This quick and warm meal comes just in time for the start of school and our rainy season here in Newfoundland. So while the wind howls outside our windows, averaging 75km/h (on a relatively calm day), and the rain patters through the holes in our leaky roof, we can curl up after a long day at school with this comforting little casserole. 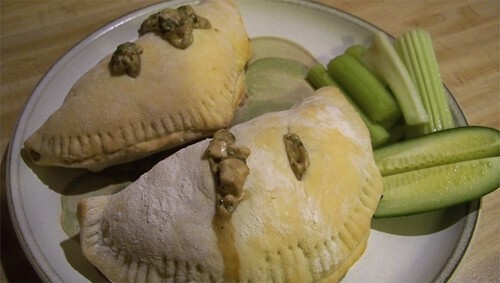 I pulled it from Metro’s recipe site, and modified it a bit because I can’t find chipotle purée anywhere (hint, hint: stocking stuffers, people). 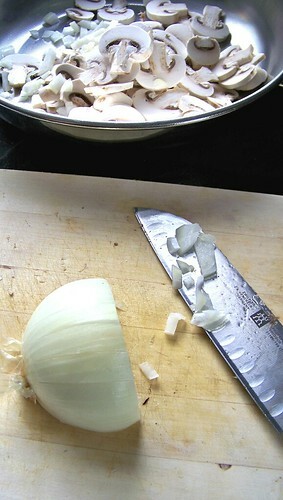 Chop up about 1/2 a small onion. 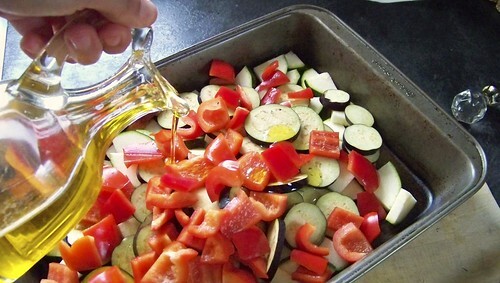 In a large skillet, heat about 1 tablespoon olive oil over medium heat. 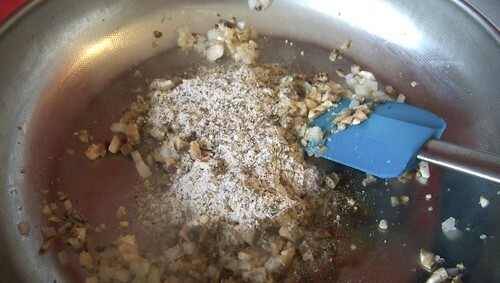 Chuck in your chopped onion and 2 teaspoons minced garlic and sweat that stuff for a minute or so. 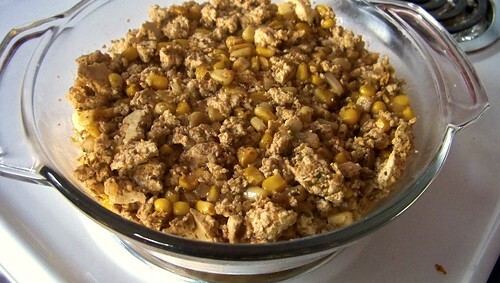 Next, crumble up 1 (1lb) package firm tofu and dump that into the pan. 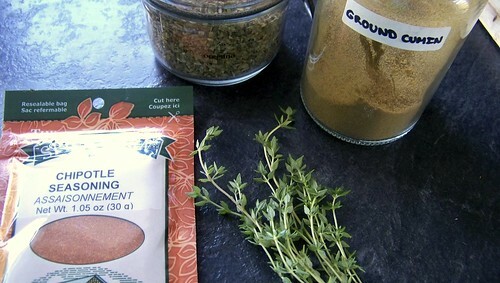 Add in 1 teaspoon ground cumin, 2 teaspoons chipotle seasoning (chipotle purée if you can get it), 1 teaspoon dried oregano, and the leaves from 4 sprigs of fresh thyme. 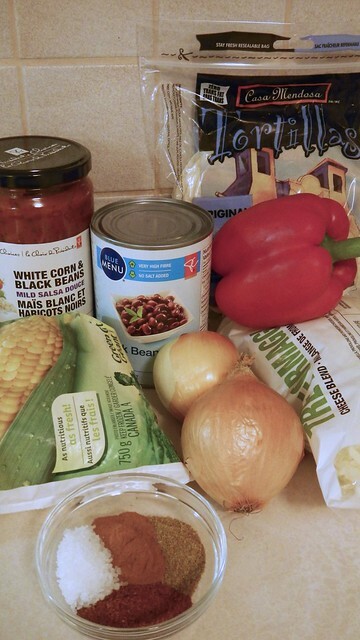 Also add 1 12oz can of corn, drained (you could probably use thawed frozen corn, too). 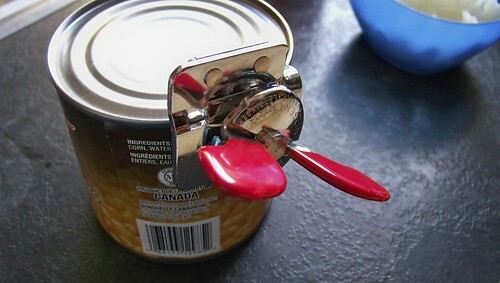 This is the world’s best can opener, by the way. We got it at Lee Valley. You should get one. Then add 1 cup vegetable broth. 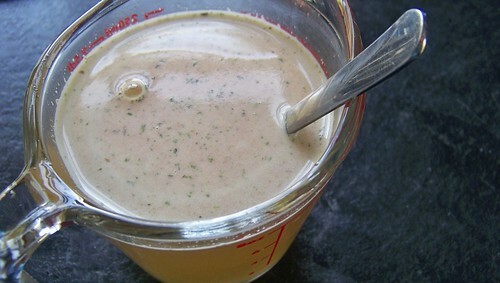 Stir that around and reduce for 5-10 minutes, or until all the liquid has been absorbed or evaporated. 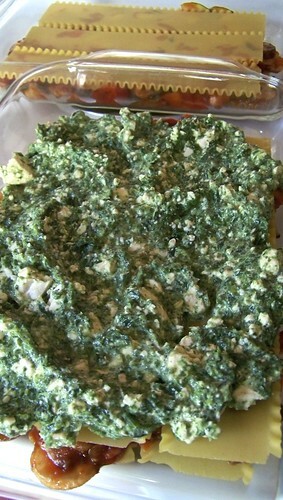 Transfer the whole shebang to a baking dish and top with 7oz crumbled chèvre (goat’s cheese). Bake until the cheese is melty (chèvre doesn’t get all runny, so you have to keep an eye on it), about 10 minutes, and serve right away. Fantastic reheated the next day as well. Who says that tofu only belongs on the savoury side of life? 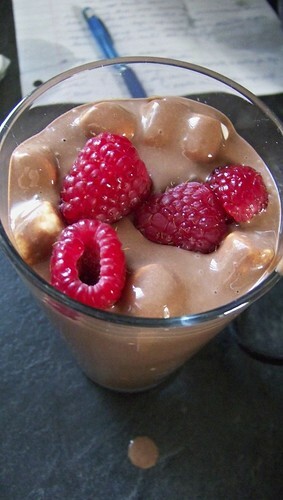 This chocolate dessert is quick and easier than doing it the hard way. The original recipe I had called for carob powder, but I didn’t have any, so I chopped up dark chocolate and melted it instead. I figured it would make a smoother treat that way. 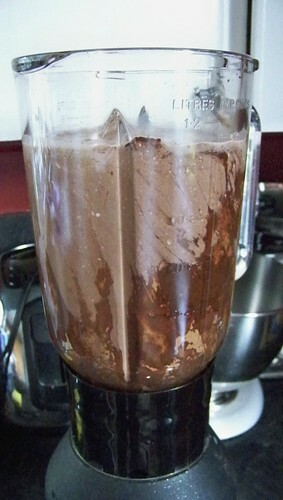 In a blender, combine 1 package soft silken tofu, 1/2 cup unsweetened cocoa powder, 1/2 melted dark chocolate, and 1/2 cup soy milk. 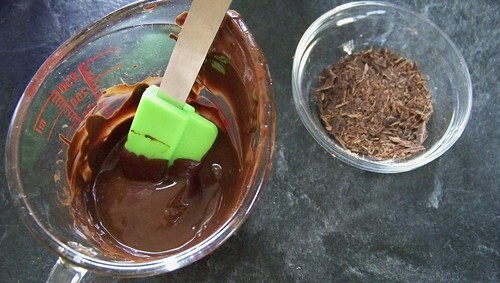 Add between 2 and 6 tablespoons of sugar (I did 2, the recipe I had called for 6, and that seemed like a lot). 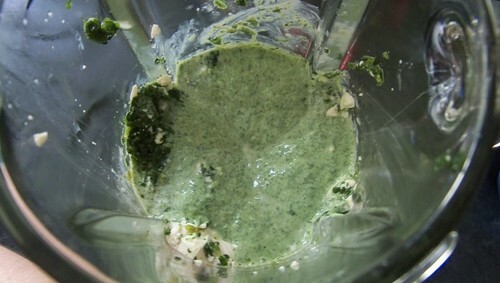 Blend that until it’s smooth. 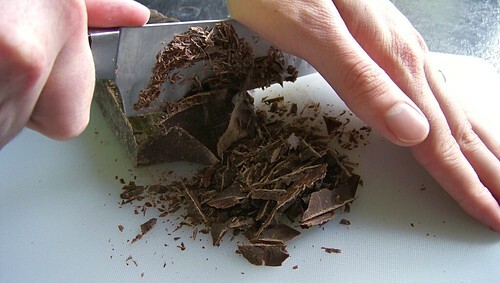 It might take some stirring to dislodge pockets of cocoa powder. 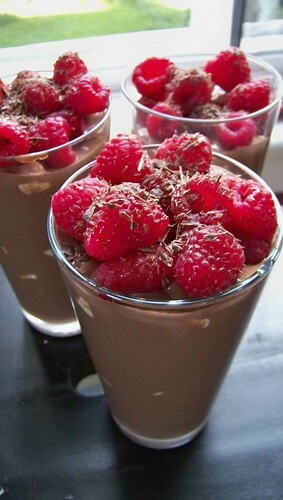 Pour into parfait cups or layer in a tall glass. 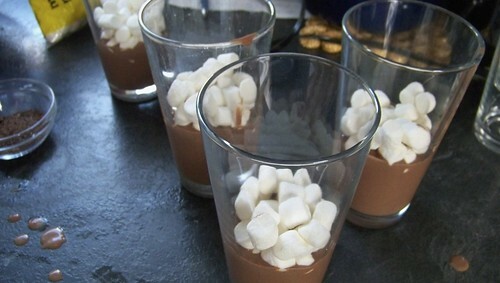 I tried to layer with marshmallows, but of course they floated when I tried to pour more chocolate on top. Yes, I am an idiot. And the fresh raspberries I put on top sank. Chill until firm(er) and serve. To be honest, I was not a fan of this dessert. Firstly, it was most decidedly not a mousse — that frothy, floating concoction that I know and love. This was more like a heavy pudding. And the smoothness of the tofu did nothing to hide the chalky feeling of undissolved cocoa powder sliding down my gullet. It tasted fine, but the texture was all wrong. In this case, I would stick with real dairy and straight chocolate. I FINALLY found silken tofu in St. John’s. I’ve been looking for it for what feels like forever. 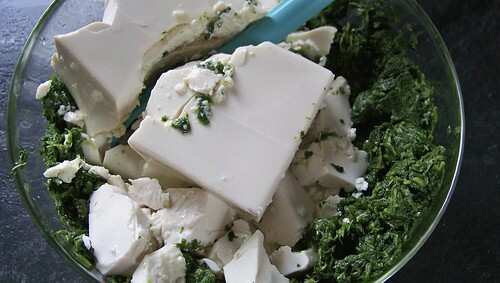 In celebration of my recent discovery, and the Pie’s insistence that he needs to slim down in time for Kristopf’s wedding next July, I have decided to honour the long-standing request of my friend Danger K and start finding new ways to cook with tofu. You might know Danger K: she recently got married (on our wedding anniversary, no less), and she and her husband planned a big fancy wedding by begging, bartering, and borrowing everything they could. Their expenses out of pocket? About two hundred bucks. You can read about the process on their blog, Project Priceless. So they’re a little bit famous back in Ottawa. And I can say that I knew her when. We went to high school together. In fact, she had a huge crush on one of my brothers (DON’T DENY IT DANGER K I HAVE PROOF). Not that I’m going to hold that against her or anything. 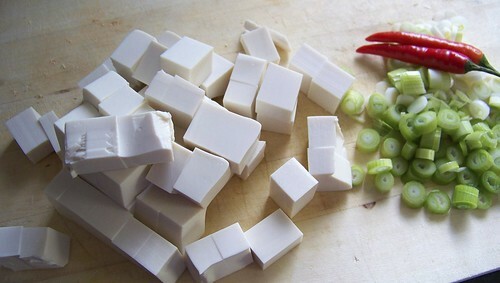 My previous experiences cooking with tofu (not in eating it, just cooking it) focused mainly on tossing cubes of it into Broccofu, Peanut Butter Spaghetti, or the occasional stir-fry. There’s nothing wrong with that, but’s not using tofu in all its myriad manifestations. This fall, the Pie and I aim to change our ways, and this recipe is the beginning. 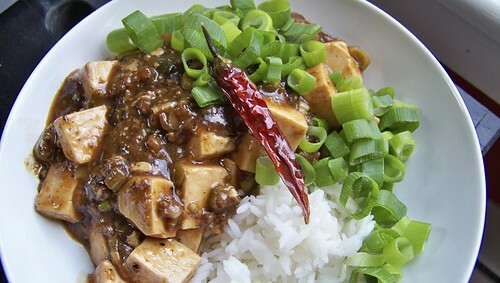 September will be a sort of Tofu Feature Month. 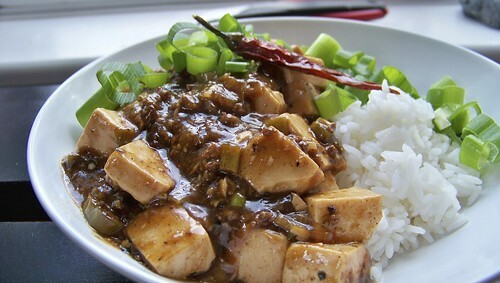 Mapo doufu (mapo tofu) is a traditional spicy dish from the Sichuan province of China and involves sautéing tofu pieces in a suspension of a paste made of beans and chilis. 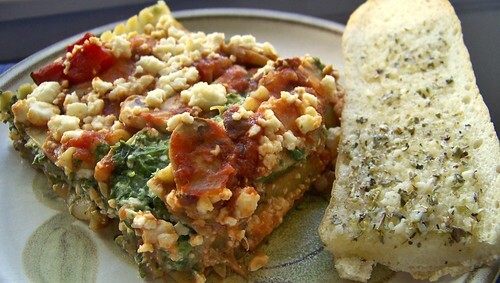 What I found particularly interesting about this dish is that I normally think of tofu as a protein-replacement for meat, but this recipe calls for a combination of tofu AND beef or pork. Very unique (for me, at least). A note on substitutions: this recipe calls for chili bean paste, a spicy gooey mixture of fermented soy beans and chilis (I’m thinking like a super-hot miso). I didn’t have such a thing, so I used black bean paste instead with the chilis, which is why my sauce isn’t that signature reddish colour. The recipe also requires the use of rice wine, which, not being a wine-drinker, I also don’t have, so we used rice wine vinegar instead. Finally, the recipe I used made little sense and required some serious moderation, so I haven’t linked you to it. I wasn’t a huge fan. Start by making up enough rice for two people. 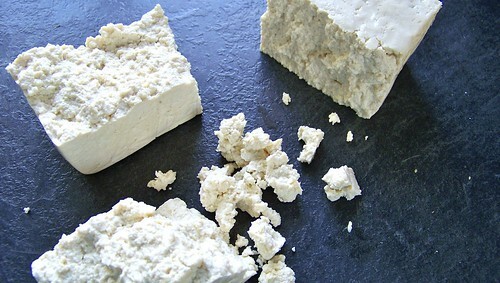 Drain and pat dry one block soft tofu (I used extra-firm silken tofu because I wanted to see what it was like). Cut it into 1″ cubes. 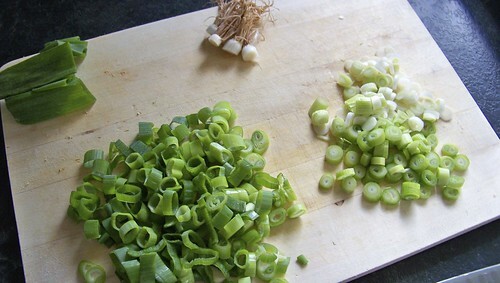 Slice up 4-5 green onions and save about 1/4 of the green tips (sliced) for garnish. 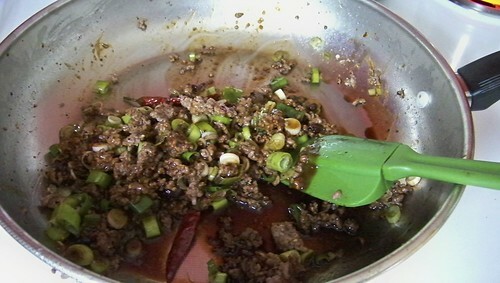 In a skillet or wok over medium heat, heat 2 tablespoons vegetable oil and sauté 4oz ground beef or pork until cooked. Drain and set aside. 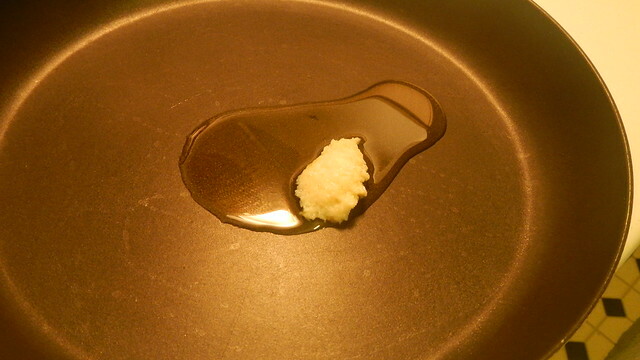 In the same pan, heat 1 tablespoon vegetable oil. 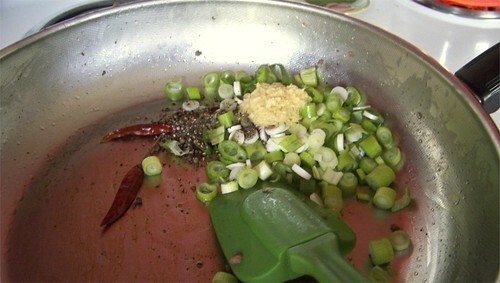 Add 1 teaspoon minced ginger, the green onion that isn’t what you saved for garnish, 2 whole dried chilis, and 1 teaspoon ground peppercorns (Sichuan if you’ve got ’em). Cook that for about a minute. 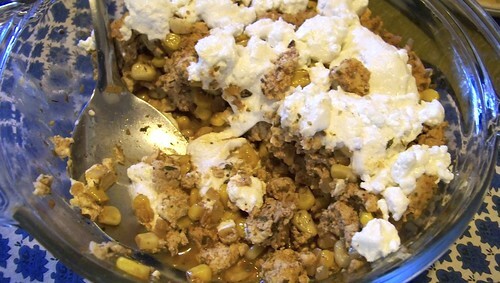 Add the ground meat back in, as well as 3 tablespoons chili bean paste, 2 teaspoons minced garlic, 1 tablespoon soy sauce, 1 tablespoon rice wine, and 2 teaspoons brown sugar. Cook that for another minute or so, just so everything can get acquainted. 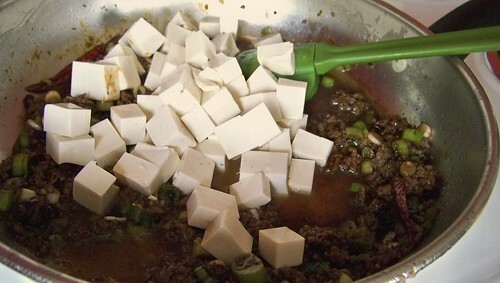 Add in the cubed tofu as well as 1/4 cup vegetable stock (or beef, or pork) and let that simmer for 15 minutes. 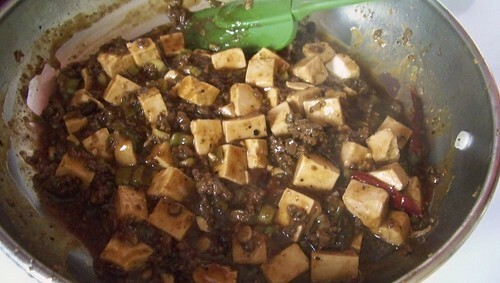 Stir occasionally, but don’t let the tofu fall apart. 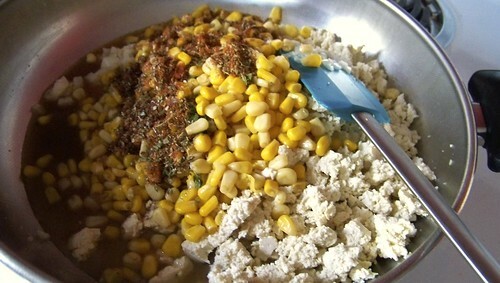 When it’s nearing done, dissolve 1 tablespoon corn starch in a little bit of water and pour that in as well. Stir gently until it thickens. 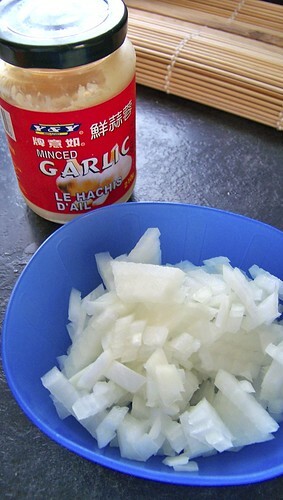 Serve over rice and garnish with the remaining green onions. SPICY! Ali Does It Herself Blog at WordPress.com.